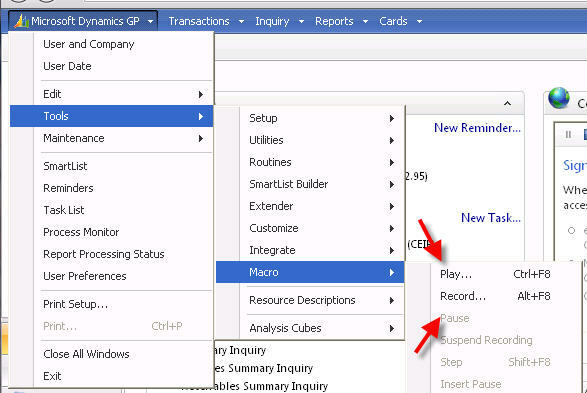 Nice article on creating Macros in Dynamics GP! Yesterday, I was asked why macros that seemed pretty straight forward and worked well in previous releases of Microsoft Dynamics GP, all in a sudden, seem not to work in Dynamics GP 10. Case in particular, a macro was previously written to automate the checklinks of the Sales Work table group and automatically close the application after completing the operation, but now seemed to hung when attempting to close. 1) The Navigation Pane feature is an internal Dexterity window. When control is returned from the check links process, the focus is immediately returned to the navigation pane, not the work area form (BuiLtin form), causing the macro command to fail. When building a macro, you can pause to allow for user input with the Insert Pause button. The problem is that the user has to know to go to Tools->Macro->Continue after they input their information. This extremely non-intuitive. A macro is a function that allows the automation of certain events in a program. In Great Plains, macros can be used to take out some of the annoying parts. For example, when we transfer money, we always transfer it one way, from Money Market to operating. Everything is the same but the dollar amount. So, I build a macro to fill in everything but the amount. Now I just run the macro, add an amount and I'm done. Sorry all, I was on vacation at the beach last week and only got 1 post in. However, being at the beach got me to thinking about how to save time! Are you saving enough time? Do you use Smartlist, FRx, Quicklinks and Macros?